May 25, 2014 · by Zack Reyes · Post may contain affiliate links. See my disclosure policy here. Barilla pasta coupons are quite common as of late. 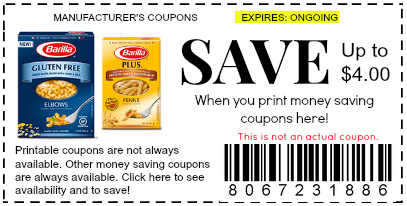 We have seen several Barilla pasta coupons in the newspaper inserts in the past few months. Now, with a couple of new types of pasta, we seem to be seeing even more of these coupons. They have a new vegetable pasta line out, where the pasta has a full serving of vegetables in it! The most recent coupons have been for that, in addition to whole grain Barilla pasta. Barilla pasta coupons are great because it helps us save money on a food that is already very cost effective. You can often find boxes of Barilla pasta on sale for only $1 per box. Barilla coupon can cut that cost in half or more! Common Barilla pasta coupons are for $0.55 off of one package. This means on a $1 sale, you will indeed save over 50% and pay less than $0.50 for a box! Get some cheap sauce, or make your own, and feed your family for super cheap! Where can I find Barilla pasta coupons? Barilla coupons are commonly found in the SmartSource newspaper inserts in the Sunday paper. Aside from that, Barilla releases coupons on their own website and through their Facebook page on occasion. Another great place you can find Barilla pasta coupons is right here on this site. When Barilla coupons are available from coupons.com, you'll find them right here! When you're looking for Barilla pasta coupons, keep your eye out for Barilla sauce coupons as well. The Barilla jarred sauces are quite good and would go nicely with the pasta. You can probably pick up one of each (pasta and sauce) for under $3 with coupons and sales! If you're shopping at Target, keep your eye out for Barilla pasta store coupons for Target. Those store coupons can be used in conjunction with a manufacturer coupons to double up on your savings. Keep your eye out for other store promotions as well to help you save even more. Whatever you do, if you happen to see a Barilla coupon online, print that baby out really quickly, because you never know when online coupons are no longer going to be available. If you have the coupon printed and ready to go for the next sale, you'll be good to go. You don't want to have passed up the chance to print only to discover an awesome sale later on down the road that you could have saved a bundle with! To print Barilla pasta coupons, click here.